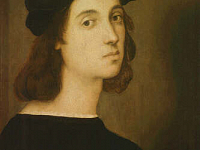 Raphael, known also as Raffaello Sanzio or for his place of birth, Raffaello Urbino; Sanzio is derived from Santi, his father’s surname, Giovanni Santi (1435 – 1494), who was also a painter and poet in Urbino. Raphael’s place as a master of the High Renaissance is mentioned next to Michelangelo and Leonardo da Vinci; though he is often compared in status to his prominent contemporaries, Andrea del Sarto (1486 – 1531), Correggio (1489 – 1534) and Titian (1485 – 1576). Raphael’s works as a painter and architect, primarily of the Florentine School, influenced a great deal of the Renaissance and beyond. 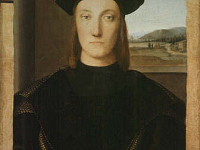 He trained first in his father’s workshop, but Giorgio Vasari (1511 – 1574) mentioned that his father placed Raphael in the workshop of Pietro Perugino (1446 – 1524). His first known work was a 1500 altarpiece in the Church of San Nicola of Tolentino just outside Perugia and Urbino. His early work is marked by an influence from Paolo Uccello (1397 – 1475 and Luca Signorelli (1445 – 1523), but he was profoundly influenced in Florence by Leonardo da Vinci (1452 – 1519) in chiaroscuro and sfumato, as well as being inspired by Michelangelo (1475 – 1564). 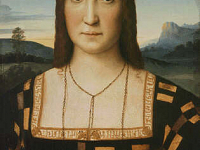 Raphael then entered his highly productive Roman period, under the almost exclusive patronage of Pope Julius II, Giuliano della Rovere (1443 – 1513) and his successor, Leo X, Giovanni di Lorenzo de’Medici (1475 – 1521). 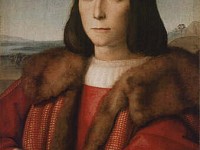 Portraits by Raphael of both men can now be seen in the Uffizi Gallery. Raphael’s works in the Vatican Palace became known as the Stanze di Raffaello (Raphael Rooms), where his famous School of Athens painting was created, among many others. It was here that Raphael worked with one of his most important pupils, Giulio Romano (1499 – 1546), who completed works in the Vatican left unfinished in the master’s death. 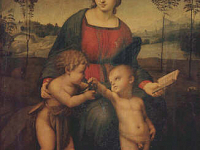 Of his works in the Uffizi Gallery are, Madonna of the Goldfinch, painted for the marriage of Lorenzo di Bartolomeo Nasi to Sandra di Matteo Canigiani in 1505; the work shows the early Florentine influence of Leonardo on Raphael in the composition’s geometric design. Also in the Uffizi from this period is a Self-Portrait, as well as an earlier portrait from 1503, Young Man with an Apple, of who is thought to be Francesco Maria della Rovere, the Duke of Urbino. 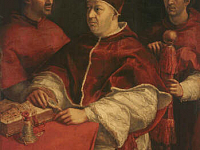 Also in the Uffizi is his portrait of, Pope Leo X with Cardinals Giulio de’Medici and Luigi de’ Rossi, Portrait of Elisabetta Gonzaga, Portrait of Guidubaldo da Montefeltro as well as works attributed to Raphael and an assistant, Saint John the Baptist in the Desert and a portrait of Pope Julius II, a copy of the master’s original now housed in the National Gallery of London. Much of Raphael’s art reached wide-spread influence due to his collaboration with the engraver, Marcantonio (1480 – 1534), who produced about 50 prints of Raphael’s works, some were copies of paintings and others were Raphael’s original designs for engravings. These prints took the glory of Raphael’s art beyond the borders of Italy, forever ingraining his influence on western art.